State and Federal laws require certain public places to have working automated external defibrillators (AEDs) on hand in case of emergency. If you or a loved one suffered a heart attack in a public place and an AED could have made a difference in the outcome, you may be entitled to significant compensation. AED heart attack attorneys can help you obtain the compensation you deserve and Attorney Richard Hastings can attempt to find you one of the best lawyers in your area to represent you. A heart attack is more likely to be fatal if an automated external defibrillator (AED) is unavailable or used incorrectly. 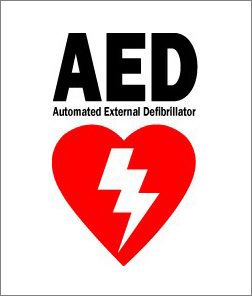 An AED can deliver an electric shock to a person suffering a heart attack to help reestablish a regular rhythm. Every year, AEDs save thousands of lives when properly used. Unfortunately, they are not always available or in good working order when you need one. Attorney Richard P. Hastings can assist victims of cardiac arrest who suffered severe or fatal heart attacks due to a property owner’s failure to provide a working AED. You may also have a case if a person failed to use the device in a life-saving manner, if a trained staff member wasn’t on site, or if a doctor failed to diagnose the heart attack. Attorney Hastings can assist people throughout the United States on cases involving negligent use of (or failure to have) AEDs as well as heart attack misdiagnosis claims. Based in Connecticut, Mr. Hastings works with attorneys nationwide who have extensive experience in AED heart attack lawsuits to ensure your case is handled with diligence and a high level of expertise. Our team can help you understand the state laws about AEDs and heart attacks in public places and your right to compensation. In addition to heart attacks in public places, Attorney Hastings can also assist heart attack victims who suffered fatal or serious injuries as a result of a doctor’s failure to diagnose a heart attack or other mistake. If you think you may need the services of a heart attack attorney, Mr. Hastings is a solid choice for assisting you. He is member of the Million Dollar Advocates Forum, a prestigious trial attorney collective that is granted to fewer than 1% of all lawyers in the country. He is also a Connecticut Super Lawyer, limited to 5% of the state’s lawyers and a New England Super Lawyer. 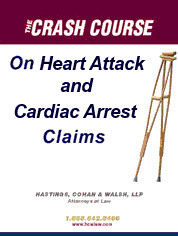 Attorney Hastings will attempt to connect you with one of the top heart attack attorneys in your state. For more information on your rights and the laws regarding AEDs in public places as well as your rights with respect to a doctor’s failure to diagnose a heart attack, please contact our heart attack attorneys right away.